Joe is from Phoenix, Arizona and avid Cardinals fan. Played Division I Hockey at St. Cloud State University and professional hockey for both the Anaheim Ducks and New York Rangers minor league affiliates in the ECHL. NFL and fantasy football enthusiast. Lost a league championship by 1 point due to a stat correction and was never the same. Follow Joe Holka on Twitter: @JoeHolka. Drafting RBs early is the comfortable and conventional approach -- but that doesn't mean it's a winning strategy. Most fantasy leagues are filled with owners that try to acquire two RBs in the first four rounds. They draft two or three elite rushers and feel like they have some type of early lead -- but all they really have is a false sense of security at football’s most fragile position. Editor's Note: Click here for 2018 RB draft strategy edition. Most early-RB drafters are at least somewhat aware of the risks involved at the RB position -- that's why they draft handcuffs. And if they don't, they at least acknowledge the need for more viable options behind their studs by continuing to load up on RB throughout the draft. One way or another, these early-RB drafters end up spending the rest of the draft letting fear drive them to protect their perceived lead. Meanwhile, sharp drafters will be subtly overtaking the RB hoarders. The sharps will load up on assets that shore up their weaknesses without diminishing their strengths. 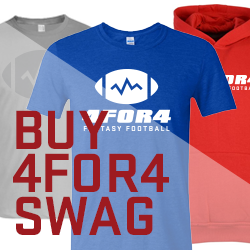 Want to be a sharp fantasy football drafter? Then draft in a way that actually gives your team a chance to improve throughout the season. Use contingency-based drafting, which entails building in as much flexibility and optionality as you can -- while also building in as much upside as possible. In essence, the Zero RB draft strategy. All the credit goes to Shawn Siegele over at RotoViz for popularizing this strategy a few years back, but Zero RB is quite simply a contrarian way to draft if your league typically goes RB-heavy in the early rounds. It allows you to take advantage of overzealous RB drafters by stockpiling high-upside WRs (and potentially TEs or even a QB). This sets your team up to improve while your competitors' teams decline as the season wears on. Zero RB works particularly well in PPR leagues, but can be effective in all league types. I've already touched on some of the reasons why Zero RB is optimal, but let's get into more detail by addressing the top three. John Paulson published a great piece that asked "Are Early Round Receivers Safer Than Running Backs?" Not only are WRs safer than RBs, but by eschewing RBs in the early rounds to draft WRs, you're positioning your team to be overwhelmingly strong at fantasy's highest-scoring position, and the position which often requires you to fill the most roster slots. The biggest obstacle you will have to get over while using the Zero RB strategy for the first time is removing your subconscious (or conscious) biases from last season. Sure, high-ADP WRs such as Allen Robinson, DeAndre Hopkins, and Brandon Marshall had their 2016 seasons ruined by Blake Bortles, Brock Osweiler, and Ryan Fitzpatrick, respectively. But what about consensus first-round RBs like Todd Gurley and Adrian Peterson? Or second-rounders like Jamaal Charles and Eddie Lacy? Or third-rounders like Doug Martin and C.J. Anderson? You get the point -- it definitely wasn’t rainbows and sunshine for everyone drafting a RB early. RBs scored a lot more touchdowns than usual. RBs got injured a lot less than usual. And even if you luck out with a DJ, Le'Veon, or Zeke, it was still possible to get someone like DeMarco Murray, Jay Ajayi, Spencer Ware, or Tevin Coleman much later. The reality is, no matter how positive we are about our RB rankings before the season, the league-winning RBs are rarely who we thought they would be. You should always be trying to gain as much flexibility and upside as possible in fantasy drafts. Zero RB still just happens to be the best way to do this. As the season goes on, the RB landscape can change very quickly, whether it be due to injuries, depth chart changes, unexpected breakouts, or something else. You have to draft in a way that profits from this chaos. Former day trader and current author Nassim Taleb has coined a phrase for something that profits from chaos: antifragility. He points out that the opposite of fragility -- being hurt by chaos -- isn't actually resiliency, because things that are resilient may withstand chaos, but don't necessarily gain from it. Something that is antifragile not only stands up to chaos, it benefits from it. You want your fantasy team to benefit from injuries and other inevitable uncertainties that will occur during the season. You want your team to be antifragile. Zero RB allows you to benefit from randomness as opposed to being a victim of it. Drafters open themselves up to a lot of risk by taking RBs in the early rounds. RBs touch the ball more than WRs, and therefore tend to get injured more. They also are more interchangeable because a lot of their success depends on their offensive line. When you draft Adrian Peterson in the first round and he goes down after three games, it will kill your team more often than not. But if your eighth-round flier tears his ACL, or is otherwise not performing well, it doesn’t hurt nearly as bad. For fantasy purposes, who cares? He was your eighth-round pick; as a competent fantasy owner, you should have no problem recovering from that. To me, a player can't be a bust unless he was drafted in a high-leverage round. Under Zero RB, when an elite RB gets hurt or underperforms, your lineup can get better in a few ways. Firstly, your opponents’ player is out, and yours isn’t. Secondly, your team gets better because you either already have the other RB in the committee, or you have a shot at acquiring the backup on the waiver wire. Early-round RB teams are resilient at best. Antifragile Zero RB rosters are able to overcome the resiliency of early-round RB rosters. Early-RB teams will inherently tend to have weaker WRs, so they will need to deploy a RB in the FLEX more often. Beyond the fact that in this day and age, most WRs will outscore RBs at similar ADP, there's also the fact that as a result of going with RBs early, early RB drafters will tend to see their team suffer from a lack of depth and upside at other positions. They'll always fear that their stud RB will go down, which causes them to forgo a lot of league-winning upside by preparing RB contingency plans throughout the draft. It is no secret that the NFL is turning into more of a passing league. You probably know that purely on a per-attempt basis, rushing is not as efficient as passing, i.e., a passing play averages more yardage than a rushing play. Now this doesn’t mean running the ball is useless -- it's imperative in real football -- but gaining smaller chunks of yardage at a time is not ideal in fantasy football. Fantasy football is about drafting the types of players that will score you the most points. PPR or not, targeting RBs who have the upside to catch a lot of passes is usually ideal. Even in standard scoring, only 10 of the top 36 RBs in 2016 failed to catch 30 passes. As spread offenses becoming more and more common, a RB who can catch out of the backfield and make plays in space is becoming more and more valuable every year, and thus is getting more opportunities to get on the field and produce in fantasy. Spread offenses rarely actually have five WRs on the field; when they go with empty backfield, it's often that a RB will go line up out wide. Backs like Ty Montgomery, Theo Riddick, and James White may not have emerged as fantasy factors in the NFL of yesteryear, but because they can line up all over the place, they're consistently getting snaps (Montgomery went from being a WR at the start of the season to his team's starter at RB n the playoffs). Beyond pass-catching skills, there are a few other reasons RBs going in the middle-to-late rounds will be undervalued. Since you're not investing a lot of draft capital in these RBs anyway, you should consider any RB slated to see significant volume, or one with the potential to do so. There is almost always a breaking point where they become values based on sheer opportunity, regardless of what you think of their talent. And since RBs get injured more than any other position, there is almost always a point where a backup becomes a starter for some portion of the season. It might be obvious, but one of the biggest components to being successful when using Zero RB is working the waiver wire tirelessly during the season. Waiting on RB can be ultimately end up as a fruitless endeavor if you completely fail to acquire any good RBs on the waiver wire all season -- it would be foolish to just sit back and count on all of your middle- and late-round draft shots at RB hitting. The amount of rushing touchdowns scored in 2016 (443) was absurd. Only four times in NFL history has there been more rushing touchdowns than last season, and two of those came before 1980. Last year was an outlier that will almost certainly regress -- especially since league-wide rushing attempts have been decreasing for five straight seasons and counting. History suggests that Zeke may have a hard time keeping up the pace of his first 42 career red zone opportunities. Since 2012, 38 running backs have seen at least 50 opportunities inside the 10-yard line and only David Johnson has maintained a touchdown rate above 35%, while no running back with at least 75 such opportunities has a scoring rate over 33%. That’s not to say I think Zeke will have a down year, it's just an example of recency bias causing drafters to forget the risk that comes with drafting RBs early. As a community, we tend to blind ourselves by chasing last year’s reality. The philosophy behind Zero RB is essentially to avoid the norm and take a contrarian approach. Once something becomes the norm, it's often no longer the most effective approach. As of this writing, our handy ADP tool tells us that seven RBs are going in the first round -- Zero RB is still far, far away from being the norm. If the RB position becomes diluted to the point where your opportunity to land the best players wanes, then you have to adjust accordingly and not prevent yourself from capitalizing on available top talent at other positions in the early rounds by drafting mediocre RBs. While I think it's fair to explore both the positives and negatives of any strategy, I cannot stress enough that every draft is different, and if you go into it with a set strategy and are unwilling to adjust in real time, you will open yourself up to the mediocrity of the norm. I almost never go Zero RB in best-ball -- it's a completely different format that should be treated as such. In a best-ball format, you can afford to draft RBs early and load up on an abundance of high-variance WRs or TEs in the middle and late rounds. The key difference is you don’t have to pick and choose which weeks to use them -- of course high-variance players will be ideal in a format where you can’t make any weekly start/sit mistakes! But in a redraft league, the consistency of top-end WRs is much more valuable than hoping you choose the right week for Ted Ginn’s 80-yard touchdown bomb from Drew Brees. On a weekly basis, it's can be much easier to find at least a serviceable RB2 that will get decent volume on your roster or the waiver wire, while that type of security just doesn’t exist as much on the waiver wire at the more volatile WR and TE positions. It's the same reason streaming a position like QB is a great strategy: it allows you to load up on more high-volume WRs in the early rounds instead of drafting a position with a high opportunity cost. I'm going all-in on the Zero RB approach in 2017, especially in PPR formats. Below is my general strategy for each part of the draft. The goal is to load up on elite pass catchers early, and lots of them. Ideally, I want four big-time WRs on my roster to fill all WR spots and the FLEX position through six rounds. It would take something pretty outrageous early to deter me from starting, at minimum, WR-WR-WR in PPR leagues. Having too many players at a position that is most important is more of a luxury than a problem. Maybe if I can grab a RB I really like, such as Ty Montgomery, at the back half of the fourth round, I'll eschew going with four straight WRs. Or if I grab a high-upside WR like Tyreek Hill or Martavis Bryant as my WR4, I usually prefer grabbing two RBs right after, from the tier containing Spencer Ware, Mike Gillislee, Ameer Abdullah, and Bilal Powell. After that, I see a ton of value at RB in rounds 13-18. Young talented backs like DeAndre Washington or Thomas Rawls should be factors for their respective teams. Hell, any one of the New England running backs could be a solid high-upside flier. The inevitable turnover at the RB position allows for these mid-to-late-round RBs to emerge as the season wears on, so I’m fine with digging deep for production and playing matchups early on while enjoying reliable production from my stud WRs. Each year, your draft plan should be dependent on the value that you see materializing in the upcoming season. It’s very important to evaluate the fantasy landscape as a whole each year while preparing for drafts. After benefiting from the advantages of Zero RB last season despite an abnormally good year for RBs as a whole, I am now more convinced than ever that going all-in on the elite options at WR early in fantasy drafts is the right move -- and I hope you are too after reading this article. Zero RB is the ideal strategy for fantasy drafts in 2017. Be sure to check out our RB projections/rankings (updated daily) and customizable cheat sheets for the best Zero RB candidates for your specific league type. You can also use our incredible Draft Analyzer to run through a mock draft using the Zero RB strategy. Photo by Dylan Buell/Getty Images. Subscribe now to 4for4 Classic, Pro, or DFS for '17! What are the Most Predictable Year-to-Year Stats for Running Backs? How Effective Will Marshawn Lynch Be in 2017? When Should You Draft Your Running Back? How Often Do Top-12 PPR Running Backs and Wide Receivers Repeat the Following Season? Danny Woodhead Had RB1 Upside at This Time Last Year - Does He Still?